As I look out over the vast Pacific Ocean I’m reminded of the reason that nearly every alien invasion movie or TV show gives for some warlike race crossing the vastness of space to come and pick on the likes of little old Earth. We do have a lot of water here, just waiting for something to come and try taking it away. Thing is, Earth is not the easiest place to get water from in our solar system. 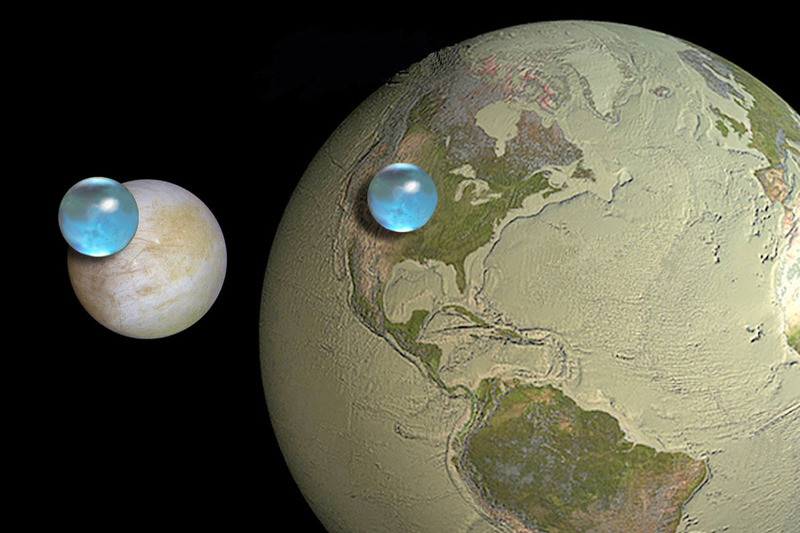 To scale, the blue ocean of Europa is larger than the water of Earth. The moon, Europa, which orbits Jupiter may be smaller than our Earth, but it is entirely covered by ice that holds a liquid ocean much deeper than the one that covers the surface of our own planet. It stands to reason then that if another race did come to our solar system in search of water, Europa would be the prime target. After all, as far as we know, Europa is not inhabited by an intelligent race with nuclear weapons. Why go poking at that race to take water when there is a larger store of the stuff far from the reach of the species’ weapons. If anything, we should look upon Europa as an early warning for water greedy aliens from afar.